The book EPIGENETICS is a global update of Darwin's book The Origin of Species. There is no other book that embraces all of the events (political, socially, biologically, nutritionally, chemically and genetically) that have been spawned since the publication of The Origin of Species by Darwin more than 100 years ago. 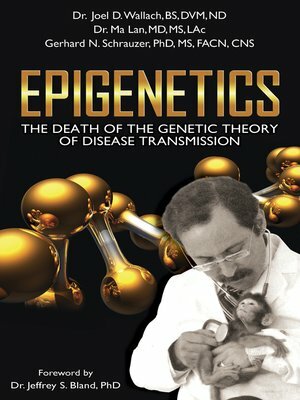 EPIGENETICS is required reading for the very survival of Americans and yes all of humanity - modern man has bet on the wrong horse to save them from disease and pestilence - the medical system has failed us fearfully. It is predictable that this book will impact the world of the everyday man, science, politics, social engineering and medicine to the same degree that Darwin's The Origin of Species did more than 100 years ago. This book will be welcomed and enjoyed by religious leaders, community leaders, educators, parents and students of biology, nutrients and genetics in all forms. The general public will obviously be the larger market. Dr. Wallach has been lecturing 300 times per year to national and international audiences for more than 20 years. Dr.s Wallach and Ma have 10 best- selling books that were self-published (the best known Dead Doctors Don't Lie -hundreds of thousands sold - a favorite with Amazon.com) and dozens of CD titles - the most listened to of which is Dead Doctors Don't Lie which has sold just short of 200 million copies - Dr. Wallach's audience is very large and very loyal. Historically, Wallach's audiences range from 100 to 500 people, however, in the last 10 years enlarged by simulcast technology his audiences can range into the tens of thousands. For 18 years, Dr. Wallach has been the host of two one hour interactive radio talk shows that air M-F from 12:00 - 2:00 PST. Since 2011 Wallach has also been allied with the GCN radio network that has 1,342 stations.